Old Rose Ox is one of B'sues true designer finishes - a gorgeous blush copper with a slight antique finish. 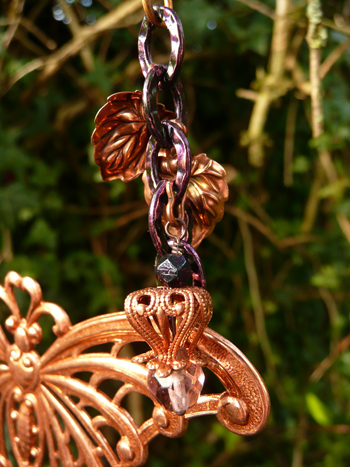 It goes beautifully well with the rusty black plating and looks great mixed with colours both subtle and bright. 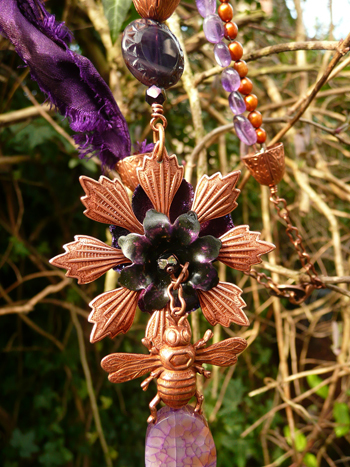 I chose to use it with purple shades- inspired by the fab colour of the sari ribbon. 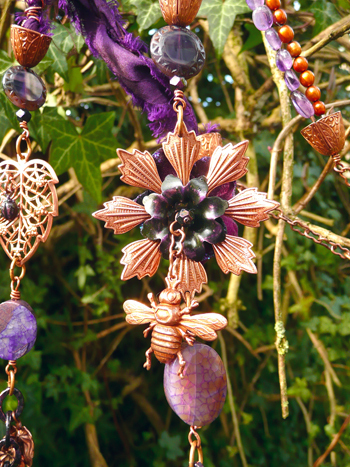 I included tones of purple in stones and beads to co ordinate and also included a cheeky bit of violet patina on the chain and flower and ladybird. Thread a headpin/wire length through a bead, fasten short length of chain to bee and slip chain link under bead on headpin (make sure chain link isn't bigger than bead!). Put headpin through small scalloped flower and then through large 49mm petal leafy centrepiece. On the reverse add as many hydrangea petals as you wish (I used 2 that I re enforced with ICE resin for strength). Coil the remainder of wire/headpin tightly with round nosed pliers to affix everything into place (B'sue did a tutorial video about stacking flowers in this way). Punch a hole on two opposite petals to use as fixing points. 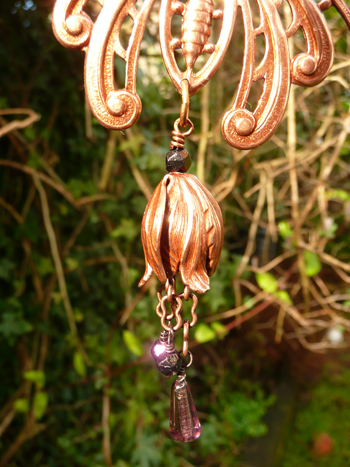 Take the elegant pierced filigree leaf and add a dangle of your choice- I used a tiny raw brass ladybird (or ladybug as you say) which I had given a violet patina and simply attached with a jump ring through the filigree. Use existing hole and space between filigree for attaching together later. 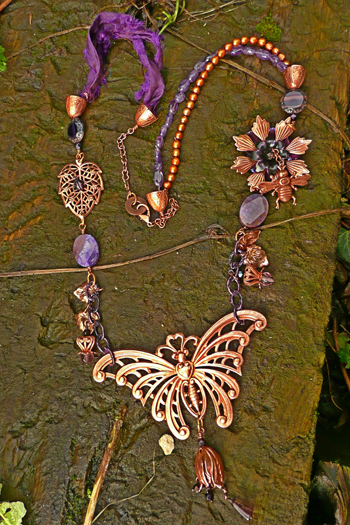 Take your 4 inch butterfly centerpiece and attach chain length through design on either wing , no need to make holes unless chain links are smaller and need to attach jump rings instead. Pierce a hole using punch on end of butterfly's body for the tulip dangle to hang from. 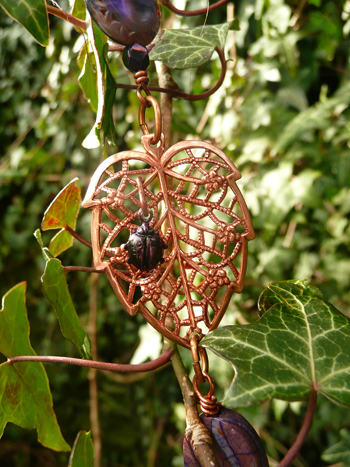 Attach dimensional leaves with jump rings to chain using chain links or jump rings. Make small drops with cube drawn beads and a headpin and bead and again using links or rings attach to chain. You can make this chain section as full as you please and attach charms and drops to each link if you like. 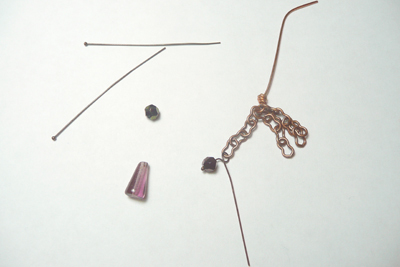 To make the dangle use a tulip bead cap, 3 sections of chain in difffering lengths to loop in a section of wire or eyepin and wire wrap beads directly to end link of chain . 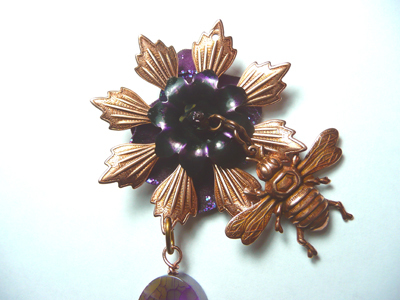 Pass headpin/wire through beadcap and make a wrapped loop and attach to body of butterfly. For the double strand beaded section I crimped 2 lengths of beading wire onto a wrapped loop on a piece of wire, always cut generous lengths of wire in case of mishap. I double crimp for extra security. 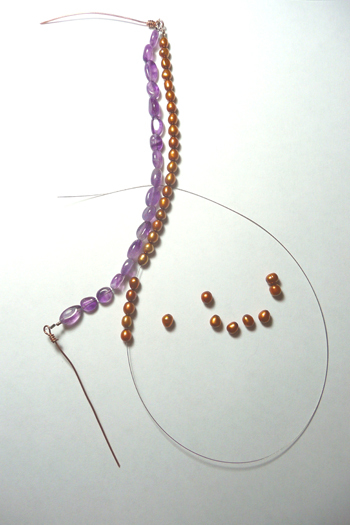 Add desired beads onto one length at a time, I used copper freshwater pearls and amethyst ovals and then crimp each length to another wrapped loop. 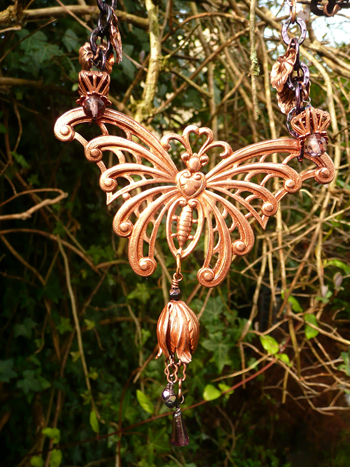 Each end will pass through a ornate victorian bead cap and then wrap a loop. One end will include a bead and the other will attach to the chain of the neckpiece and clasp. The sari ribbon section on other side of necklace is simply a doubled length of sari ribbon and then wired at either end and attached with a wrapped loop to the ornate victorian beadcaps (those beadcaps remind me of acorn caps). Make wrapped loop sections with you chosen stones or beads (I used dragon eye agate ovals) and then you are ready to attach all pieces together. Voila ! Of course you could use any combination of beads, stones or charms to complement you Old rose ox pieces.